The University of North Florida announced that it will cut ties with the China-funded Confucius Institute on its campus. Others of the approximately 100 colleges and universities hosting Confucius Institutes are considering doing so as well, or have already done so. Ostensibly, Confucius Institutes are apolitical partnerships between American and Chinese universities, giving American students opportunities to learn to speak Chinese or study abroad. But the Chinese themselves say that they serve as "an important part of China's overseas propaganda," and they also serve as outposts of China’s intelligence and surveillance operations, as FBI Director Christopher Wray testified to the US Senate in February. In addition to the 100-plus Confucius Institutes in the US, China runs about 500 "Confucius Classrooms" at American K-12 schools. In Australia, New Zealand, Canada, the United States and other countries, China runs 1,500 Confucius Institutes and Classrooms, with 40% of them in the US, more than any other country. The Confucian Institutes are one of the programs of Beijing's international coercive propaganda agency, the United Front Work Department (UFWD). Every aspect of the Confucian Institutes is tightly controlled by the Hanban agency, the Chinese Communist Party agency that oversees all Confucius Institutes. Teachers and teaching materials are all supplied by China. Taiwan and Tibet are portrayed as undisputed territories of China, with no alternate views permitted. The 1989 Tiananmen Square massacre, the one million Uighurs in re-education camps, the human rights abuses in China are all forbidden subjects. The Confucian Institutes really have nothing to do with Confucius, but if they were called the "Chinese Communist Propaganda Institutes," then they would be rejected. However, most Americans associate Confucius with wisdom, or cutesy aphorisms, so the use of the name Confucius Institutes has been a great success for China. In recent weeks, I've been doing my own research on China's ancient philosophers, including Confucius, and this is a tentative summary of what I've learned so far. Confucius lived around 500 BC, and was a contemporary of Sun Tzu, who wrote the Art of War, a book that is so popular that it's probably the closest thing that the Chinese have to the Bible. Sun Tzu was a brilliant war strategist and tactician. From deception to beheadings, every tactic is on the table for winning wars. Compromise or mercy are never possible. If Sun Tzu's work was the recipe for imperialist warfare, Confucius' work was the theology of imperialist warfare. 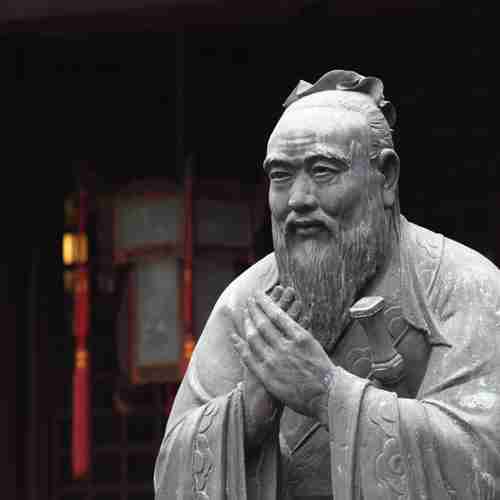 Confucius lived at the time of the Zhou Dynasty, about five centuries after it had beaten the Shang Dynasty. How were the Zhou able to defeat the Shang? Much of Confucius' work is devoted to answer that question in a theological framework. The Shang worshiped a heavenly ancestor called Shangdi ("the Lord on high"), and kings were permitted to rule under the power of this god. When the Zhou defeated the Shang, they replaced (or merged) Shang Di with their own god, Tian, a sky god, a "deity above who rules the Heavens." "We do not presume to know and to say that the lords of Yin (Shang) received Heaven's Mandate for so many years. ... But they did not reverently attend to their virtue and so prematurely threw away the Mandate. ... Now our king has succeeded and received the Mandate. ... Being king, his position will be that of a leader of virtue. ... The Son of Heaven could not properly fulfill his functions unless his moral nature was pure and his conduct above reproach. Heaven could not be served by a tyrant or a debauchee, the sacrifices of such a ruler would be of no avail, the divine harmony would be upset, prodigies and catastrophes would manifest the wrath of Heaven." Confucius formalized and strengthened this doctrine of Tian and the Mandate from Heaven. He wrestled with the same "theodicy" contradiction that every religion faces: If God created everything, the God created Good and Evil, so how could God be good if God created evil? the variable, unpredictable nature of its associations with mortal actors. Since Tian depends on human actors to implement its will, Confucius insists on moral, political, social, and even religious activism. Only through this activism will a society maintain a harmonious order. When you look at the work of Sun Tzu and Confucius, and use their work to analyze modern events, you see that both philosophers lack any idea of a "peace conference" or a "United Nations." Since the Chinese king was the Son of Heaven and received its Mandate from Heaven to rule, it would not make sense to sue for peace with anyone else, because no one else had the Mandate from Heaven. But if there's no peace, it's still possible to take advantage of a "peace process." Sun Tzu said that "All warfare is based on deception," and he advocated the use of deception first, and actual war as a last resort. So for China today, the United Nations is a tool to bring about peace, but a tool to be used with deception to win the war. For example, China treats international law with contempt, saying that its own law supercedes international law as in the South China Sea, where China is criminally violating international law, but still references internation law when it favors China. This is a perfect example of deception and manipulation. China is contemptuous of international law, but still uses it as a tool of deception. Many people know nothing about Confucius except his sayings, whether or not he actually said them. "Confucius say" sayings are often meant to be funny, and can often be found as sayings in fortune cookies served after meals in a Chinese restaurant. Here are some examples: "Confucius say: Man with one chopstick go hungry." or "Confucius say: Man who cut self while shaving, lose face. " or "Confucius say: Man who jump off cliff, jump to conclusion! " or "Confucius say: Man should not sleep with woman with more troubles than he have." Those sayings are meant to be funny, but he probably never said them. "The journey with a 1000 miles begins with one step." "Learn avidly. Question it repeatedly. Analyze it carefully. Then put what you have learned into practice intelligently." "If you are the smartest person in the room, then you are in the wrong room." "Act with kindness but do not expect gratitude." "I slept and dreamt life is beauty, I woke and found life is duty." "By nature, men are nearly alike; by practice, they get to be wide apart." "To see the right and not to do it is cowardice." "If we don’t know life, how can we know death?" "Give a bowl of rice to a man and you will feed him for a day. Teach him how to grow his own rice and you will save his life." "Never give a sword to a man who can’t dance."